As a single Mom of 6, finding time to Christmas shop and wrap during the busy holiday season is difficult. Finding time to shop for gifts without my children is never easy. In fact, with 6 of them and only one me I often have trouble shopping online undetected! Once the gifts are all gathered the next problem is carving out time to wrap the presents without the children catching me! The last thing I want when wrapping Christmas presents is to feel stressed out and rushed. Christmas present wrapping time should be a happy time, not a stressful one! Make the rest of your day as stress-free as possible. Chose a day for gift wrapping that isn’t already packed full of other commitments and duties. Keep wrapping day a fun and relaxed time all day long. Be sure your dinner plans for the evening are easy- buy convenience food and use paper goods so you are out of the kitchen fast! This year I picked up a Pizza & Coca-Cola™ deal from Kroger on my way home from buying a few last-minute presents. Easy dinner is a must on gift wrapping night! Have wrapping supplies ready to go. In the days leading up to your wrapping day, gather all your wrapping supplies into one convenient location, such as under your bed or in a closet. 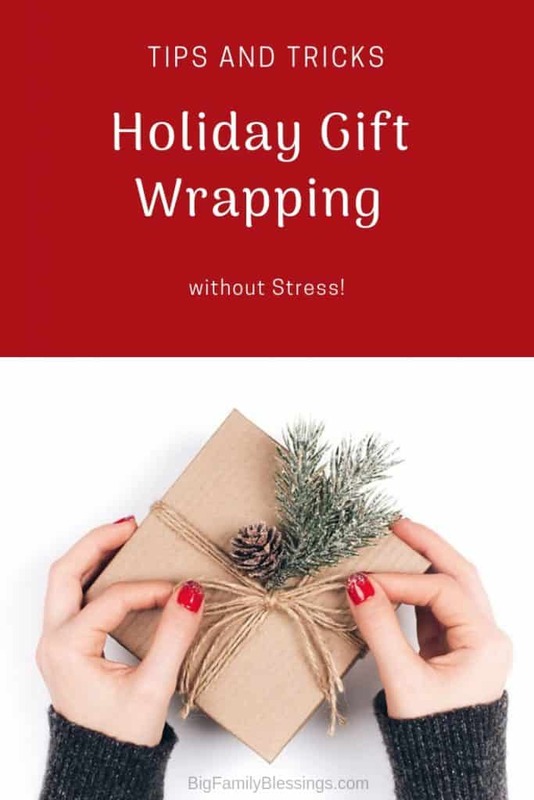 The last thing you want on wrapping day is to spend half your time running around the house searching for supplies, or worse to run out of tape, boxes, or wrapping paper! Gather extra boxes, lots of wrapping paper, tape, scissors, a few pens, gift tags, bows, and ribbons. Occupy the kids- or get them out of the house. If at all possible get your children out of the house for a few hours. Could they have a movie night with a neighbor? Or maybe their dad or another relative could take them out to dinner? If no help is available, occupy the kids before locking yourself into your wrapping location. Grab a pizza & Sprite® from Kroger to serve everyone for dinner, pop some popcorn, and leave the children with a stack of Christmas movies to watch while Mom sneaks away to wrap. Once you sneak away from the children to wrap gifts, take a moment to set the Christmas mood. Turn on Christmas music, grab your favorite beverage. Take a minute to unwind alone with your favorite Christmas music and your dinner. Doesn’t it feel great to have presents wrapped? I love the feeling of placing that last present under the tree after an evening of wrapping. Great tips! I'm planning on doing exactly this, this week since I haven't gotten any wrapping done yet and this week is going to be a crazy one!